MADISON COUNTY - As the school year gets rolling for districts around Madison County, local bus drivers and law enforcement continue to deal with drivers ignoring regulations involving school buses. ENNIS—A recent federal report surveyed school districts around the country and found that fewer than half of them regularly test for lead in their water supplies. MADISON COUNTY—The Annie E. Casey Foundation released its KIDS COUNT Data Book for 2018 on Wednesday, June 27. VIRGINIA CITY – Recent election results from local schools and the hospital are now available. The school district results are not official. The existing school boards must canvass these results before they are final. However, the hospital result is final. Below are the winners of these elections. Ennis School held a meeting for those interested in becoming bus drivers on March 27. While the meeting was slim with recruits, transportation supervisor John Lee provided information about school bus routes, trainings and certifications, and potential benefits. 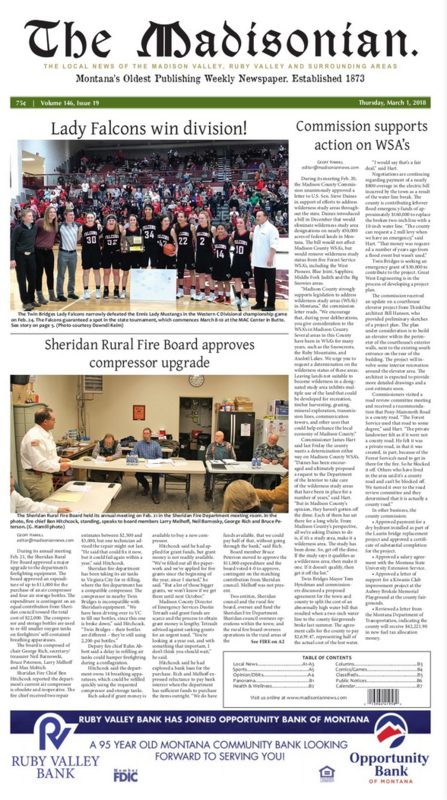 The Sheridan School Board met on March 13 for their regular monthly meeting and discussed the upcoming election. According to District Clerk Rebecca Larsen, the board decided to go against running a general fun levy, however, are looking to run a continued building reserve levy for both the high school and elementary, and a technology levy.